Your donation to SCID, Angels for Life Foundation supports our mission to increase awareness, benefit research, and provide parent and family education for those affected by SCID. Your secure donation may be made online by clicking on the Donate link below. For those of you who are interested in making a donation in memory or in honor of an individual, please click on the small + sign next to “special instructions” and list the Honoreer or Memorial information there. Upon receiving this information, PayPal will promplty email an acknowledgement of your contribution. Looking for more ways to help? Find out how to do more! 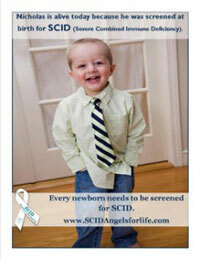 SCID, Angels for Life Foundation is a 501(c)(3) non profit organization and contributions are tax deductible to the maximum extent allowed by IRS regulations. Our Federal Tax ID number is 26-2301379. Please consult your tax advisor to determine the tax deductibility of your contribution.